Curator decorative art and design Justine Olsen chooses her top ten objects exhibited in European Splendour: 1500–1800. The objects below are mainly decorative and through them we see changes in style, materials, and techniques. They offer a valuable insights into a bygone age and highlight the impact of religion, trade, culture, and the way European society viewed itself. This is a rare work of craft, a religious object too, made for ceremonial splendour over 500 years ago. Embroideries, wall paintings, and stained-glass windows enriched the religious experience in late medieval churches. Created to honour God, they also reminded worshippers of the principle message of the Roman Catholic Church – Christ’s death for the salvation of mankind. This cross was once the central image on a priest’s chasuble as he celebrated Mass, its golden gleam a signal of the divine and a reminder of the church’s wealth. 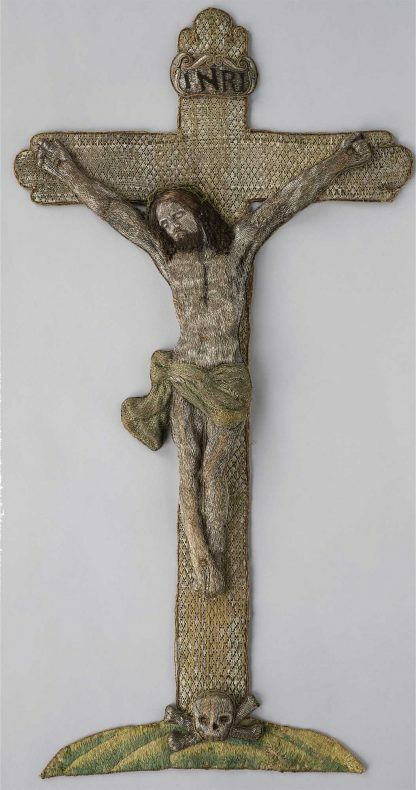 A plaque above the head of the crucified Christ is inscribed ‘INRI’, the Latin acronym for ‘Jesus the Nazarene, King of the Jews’ – a gospel reference for those few who could read. The embroidery was probably made in a workshop attached to a monastery or convent; goldsmiths and embroiderers were also part of religious orders. Gilded silver and copper wire, and silk thread are the main components of this work. The 11th-century Benedictine monk Theophilus described how fine wire was made by pulling metal rods through a tool called a draw plate. It was a time-consuming and methodical process. Eventually the wire was wrapped around silk thread for the careful work of embroidering the divine image. This meticulous task was often carried out by unmarried women from noble families who had found refuge in Italian nunneries. Two figures at a well, the English oak and chestnut tree with a squirrel and scavenging dog, may at first glance suggest a charming English pastoral scene. But look closely and you will see a halo around the head of the central figure. 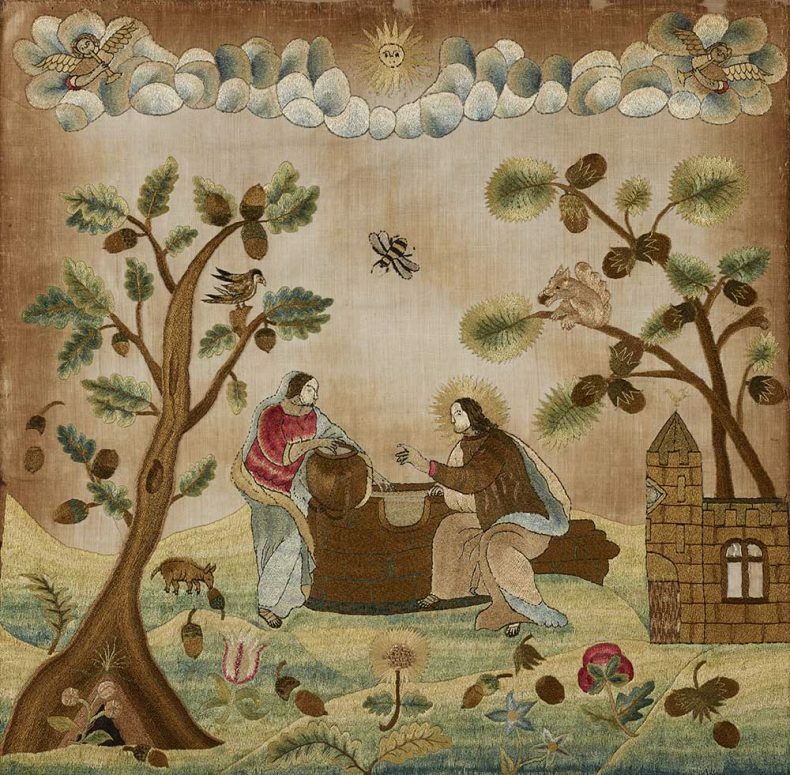 The image is in fact a reminder of the gospel story of Jesus converting the Samaritan woman at the well, transporting this textile into the realm of religion. It’s a cue too that in England religious embroideries were made for the home, rather than the church, following the period of religious upheaval known as the Protestant Reformation. Embroideries like this were replicated due to the use of pattern books available at the time. Much like Protestant texts, they were able to be circulated because of the advance of the printing press. Reproduction aided the transmission of information, style, and meaning. Domestic textiles were among the most valued works in the home during the 17th century, with needlework carrying out the important function of decorating clothing, furnishings and wall hangings. This is a type of christening spoon that was given to a godchild, symbolising the hope of a spiritual and prosperous life. Saints were carefully depicted in the terminal of the handle. In this particular example it is Saint Andrew, the patron saint of medicine, who holds a staff and a book of the Gospel. By the mid 17th century, silver and gold objects were visible in the homes of the new elite in European society. Though the Protestant Reformation meant that precious materials were employed less frequently in church ceremony, Spanish conquests in South America ensured a ready supply of gold and silver for domestic use. Delicate, versatile, and alluring, lace has a vital role in the history of dress and luxury. It was worn by both men and women, and caught the imagination of royalty – as seen in the portraits of Queen Elizabeth I (reigned 1558–1603) and Princess Charlotte of Wales (1796–1817) within this exhibition. In the 1500s and early 1600s, fine lace was subject to ‘sumptuary laws’ designed to restrain extravagant consumption and reinforce social hierarchies. And yet its irresistible beauty overcame restrictions through the evolution of local industries. From cut-work to needlework and bobbin lace, designs and production spread. Venice, Flanders, and Valenciennes were among the pre-eminent producers while the development of printed patterns helped too. And while this bobbin lace predates the lace worn during the time of the Marquis de Sainte-Maurice by 50 years, you can see the imaginative and delicate qualities that remained so appealing. I L, Toilet Box, 1691, sterling silver, Bequest of Lady Vivien Younger, 1958. In the late 1600s, the rituals of grooming and dressing underpinned courtly life. The flamboyance of the French court of Louis XIV (reigned 1643–1715) pervaded high society throughout England and the continent, and dress and adornment took on an ever-increasing role. This silver toilet service – a box, brushes and mirror – would have indicated the wealth and status of the noblewoman whose bedroom it adorned. Looking at the service, we know that it was made in London – the stamp of the leopard’s head with the sterling silver stamp of the lion passant guardant (silhouette of a lion with his face towards the viewer) certifying its quality (92.5% pure silver). But the marks provide more clues about the maker: a fleur-de-lis emblem, which was used by Parisian silversmiths, appears below the initials ‘IL’. Thousands of French Protestants, known as Huguenots, took refuge from religious persecution in England in the late 1600s and 1700s. In 1689 the new English Bill of Rights proclaimed religious tolerance towards Protestants and London attracted their skills – silversmiths and silk weavers were needed to support an increasing wealthy society. The effect of religious persecution and the movement of skills continues to be felt today. This still-life painting offers a glimpse of domestic life 400 years ago. It’s a German scene about personal possessions, production, and lifestyle. Within this resplendent dining setting, we can see food for the table and vessels designed for the occasion. Together, they reflect prosperity, the growth of the cities, and desire for comfort and display. Two German objects dominate the scene: a Westerwald jug on the left and a Roemer glass on the right. The salt-glaze stoneware jug was a product of the Rhineland. Made from local clays, its durability and ornamental appeal satisfied European taste. Decorated with incised designs, the jug includes a silver-mounted handle with lid – a signal of its prestige at the time. Roemers are green wineglasses also popular in the Rhineland. This example is studded with prunts shaped as raspberries – motifs that were not only decorative, but also helped the wine drinker maintain a good grip. It’s a large, stylish glass for festive and daily use. 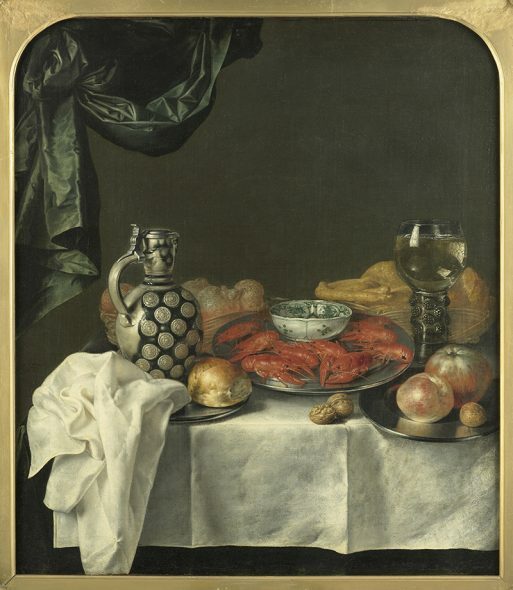 Taking central place are the most prized objects in the scene – lobster from Norway, the most valuable crustacean in Europe, displayed around a Chinese porcelain dish. By the 17th century, exotic Chinese porcelain was the most desirable of goods in Europe. The decoration and shape of this dish suggests it could be Kraak porcelain intended for export to the West. It was made in Jingdezhen, which mass-produced porcelain for the local and international market. The painter treated his images with care. Look closely and it feels like you can almost reach out and touch the objects. The exuberant baroque style arrived in England through the patronage of monarchs Charles II (reigned 1660–85) then William and Mary in 1689. Its flamboyant and ornate variety of architecture, fashion, and decorative arts was expressed principally through the French court of Louis XIV (reigned 1643–1715). Furniture design was very much part of this fashionable elitism. 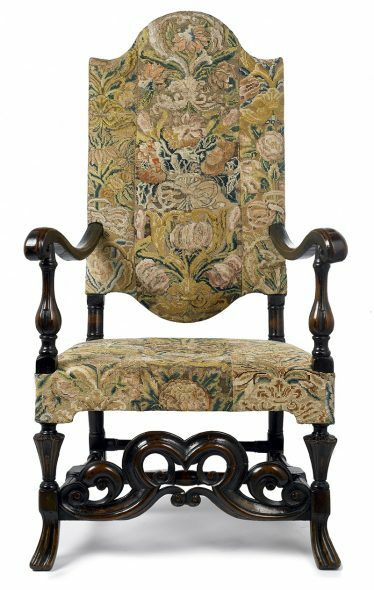 Chairs were largely the preserve of the wealthy, reflecting the status of the individual while also beginning to offer comfort through upholstery. There are elements of this chair that show how keenly the baroque style played a part. The front horizontal leg-support, or stretcher, is carved in a foliage scroll pattern – a decorative device adopted by the French court. Symmetry holds the design together, as the scrolls and plant-like features elegantly roll across the stretcher. How was this style accessible to craftspeople at the time? Printed books helped circulate such designs, ensuring fashion was up to date, a little like internet media today. Ceramics were part of the splendid domestic settings of Italy’s urban elite during the Renaissance period. The display of objects ensured an extravagant scene of metalwork, glassware, carvings, furniture, textiles, and ceramics. Families involved in commerce and civic duties commissioned such work from many of the best artists and craftspeople. 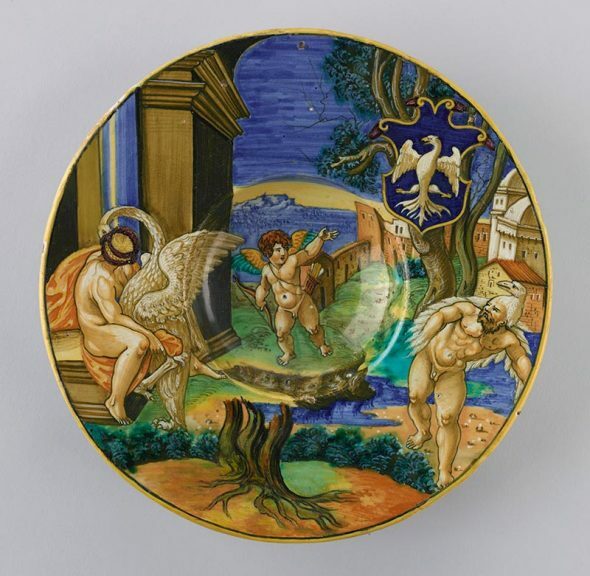 We know this astonishing dish was created by the celebrated artist Francesco Avelli da Rovigo of Urbino, thanks to the signature on the back. The dish was probably part of a large set. It is an example of maiolica decoration, where costly tin oxide provided an opaque white surface on which to paint colourful, complex scenes. Mythological stories were frequently used, reflecting the era’s rediscovery of ancient Greek and Roman culture. In this dish Zeus is depicted as a swan seducing Leda; it was a scene commonly used by artists of the time, including Leonardo da Vinci. We also see a heraldic coat of arms within the decorative scheme. The eagle splayed with its head to its right suggests the dish may have been commissioned by the Borghese family, one of the most prominent families in central Italy. Trade with Japan in the 1600s brought to the European market the unique style of Japanese lacquer. This glowing, hard material, similar in look to today’s plastics, was extracted from the lac tree and then processed into red or black lacquer varnish. It was applied to cabinets and coffers for the West, which were decorated in the so-called international style or Namban. Te Papa’s cabinet on stand displays the Namban style through the geometric borders, shell inlay, and a decorative technique called hiramaki-e (literally, ‘sprinkled picture’). A polychromatic effect is achieved by sprinkling gold and silver dust on the lacquer before it dries. This can be seen on the inside panels of the cabinet’s doors, where meandering vine tendrils are framed by painted decoration. 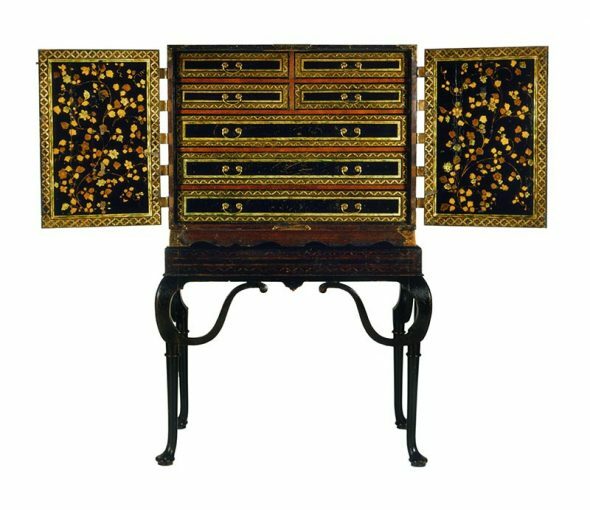 Such cabinets were intended to store precious objects, indicating a private display of wealth, an interest in the Orient, and collecting. Blue and white porcelain may seem ubiquitous today, but in Europe during the 1600 and 1700s the allure of this oriental style led to extraordinary results. 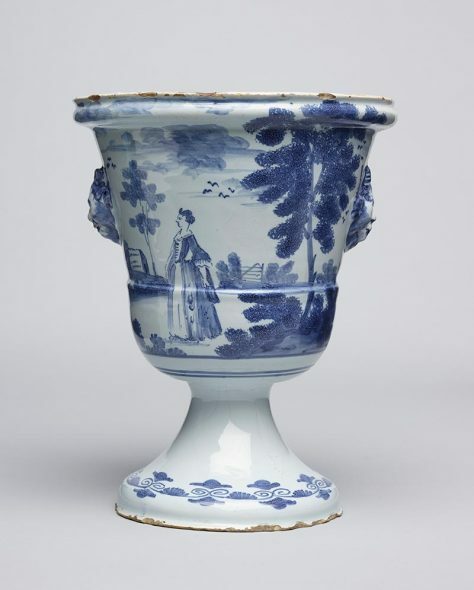 European trade with China, the main source of porcelain, inspired fashionable collecting: its exotic beauty led the English Queen Mary II (reign 1689–94) to decorate rooms at Hampton Court and Kensington Palace with fine ceramics. By the 18th century, attempts to emulate Chinese porcelain led to success at Meissen, Germany. British factories also attempted to reproduce porcelain, using a tin-glaze earthenware, soft paste, then hard paste. This vase sits at a time of transition. Made in Bristol, it shares with Chinese models the characteristic cobalt blue glaze over a white ground. Its depiction of a country scene locates it in England, an enormous cultural shift for an object whose origins lay in the Far East. *Most of the works in the exhibtion were gifted to the national collection from New Zealanders whose ancestors were part of that distant world. Thank you for sharing these spectacularly beautiful objects. It has certainly made me feel that a trip to Wellington to view the exhibition would be worth doing. The tin-glaze on the vase shares a similar bluish tone as the imported Chinese porcelain of the period. Look at this tea bowl seen on collections on line which also appears in ‘Splendour’. Apologies for the pedantry, but I’m afraid your ‘porcelain vase’ is no such thing. As you know, tin-glazed earthenware isn’t porcelain, being composed of different sort of clays, fired at a much lower temperatures and, unlike most porcelains, lacking translucency. I suspect too that your urn-shaped Bristol ‘vase’ is better described as a jardinière or cachepot. It’s hard to differentiate these things in New Zealand where we don’t have the collection resources of the V&A or the NGV, so I think it’s important to identify these little details correctly. As you will see in the caption below the image, that the blue and white vase is indeed tin-glaze earthenware. Apologies from the web team for the title that was misleading. It has since been corrected.